This is the third installment of a multi-part series covering light mountaineering and ski harnesses. The first review covered the Mammut Zephyr Altitude followed by the Camp Alp Mountain and of course this one covers the Petzl Altitude. I’ll continue the series if there’s a good response and I’m able to get some more test samples. At less than half the weight of a standard climbing harness, the innovative new Altitude harness from Petzl has taken lightweight to a whole new level. The design of the almost skeletal Altitude also focused on eliminating bulk to produce a harness that packs down to the size of a couple of decks of cards. If you’re heading out into the mountains and aren’t sure if you need a harness there’s no reason not to through the Petzl Altitude into the bottom of the pack, just-in-case! 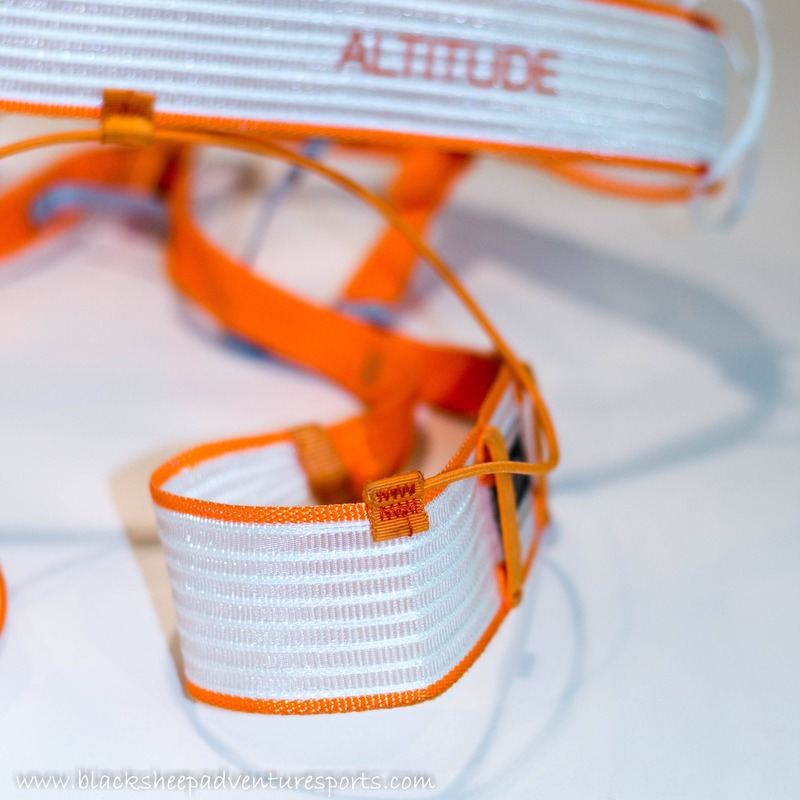 The Altitude utilizes Spectra® in what Petzl calls WIREFRAME Technology to create wafer thin waist and leg loops. Basically they’ve run strands of Spectra® through waist-belt and leg loops instead of a loop or two of webbing. As these strands of Spectra® are spaced out they don’t create pressure points eliminating the need for foam padding to distribute the load. The result is an ultra-light and extremely packable harness. 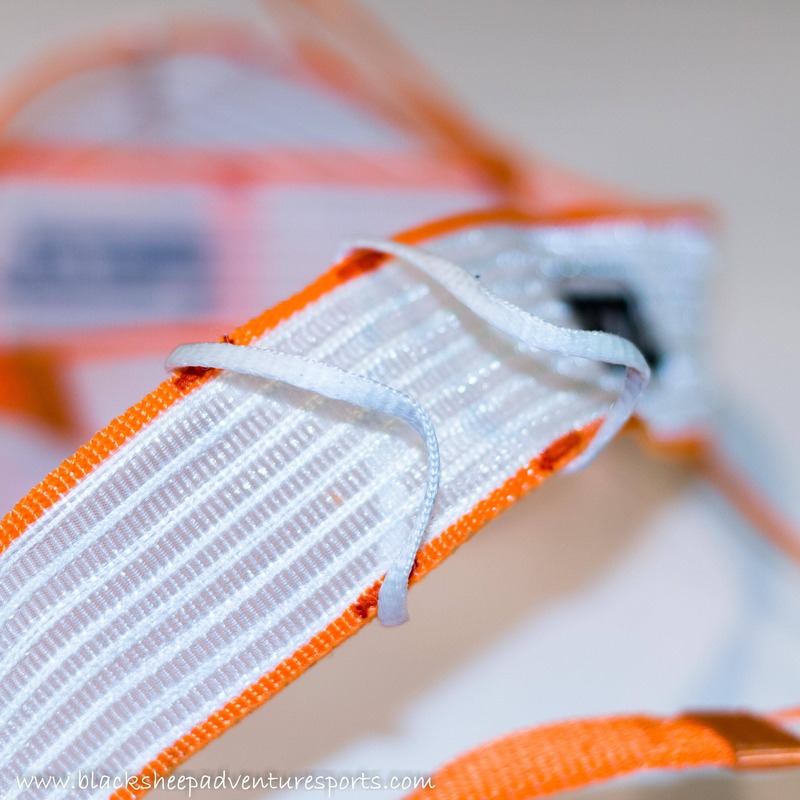 The strands of Spectra that form the structure of the Petzl Altitude harness are visible in the waist band and leg loops. As with all ski/mountaineering harness the Petzl Altitude can be put it on (and taken off) while wearing skis or crampons. The Altitude accomplishes this in a similar fashion to other such ski/mountaineering harnesses where the leg loops have plastic buckles to hold them in place and the waist strap is fed through the belay loop before going through a buckle. To secure the waist belt in place the nylon strap is fed through a large buckle, hard to feed while wearing gloves but simple and effective. The nylon waist strap does not have any wear protection which may limit the lifespan of the harness. To help keep the Petzl Altitude simple and lightweight the leg loop elastics are not adjustable and don’t have a drop-seat clip. The gear loops on the Altitude are also quite innovative. Instead of going with the traditional horizontal alignment they opted for vertical loops. The down side to this design is that gear clipped into a loop is bunched together. 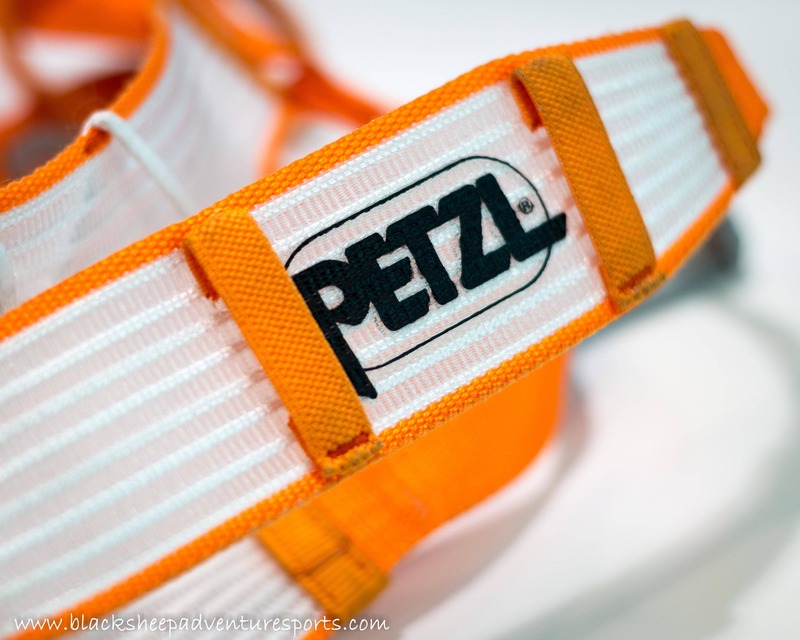 To address this issue Petzl gave the Altitude harness 4 gear loops to help spread things out. The up side is that the thin and lightweight Spectra® loops don’t need any stiffening or support to stand out from the harness making them easy to clip while the thin fabric of the loops doesn’t create pressure points when worn under a pack. 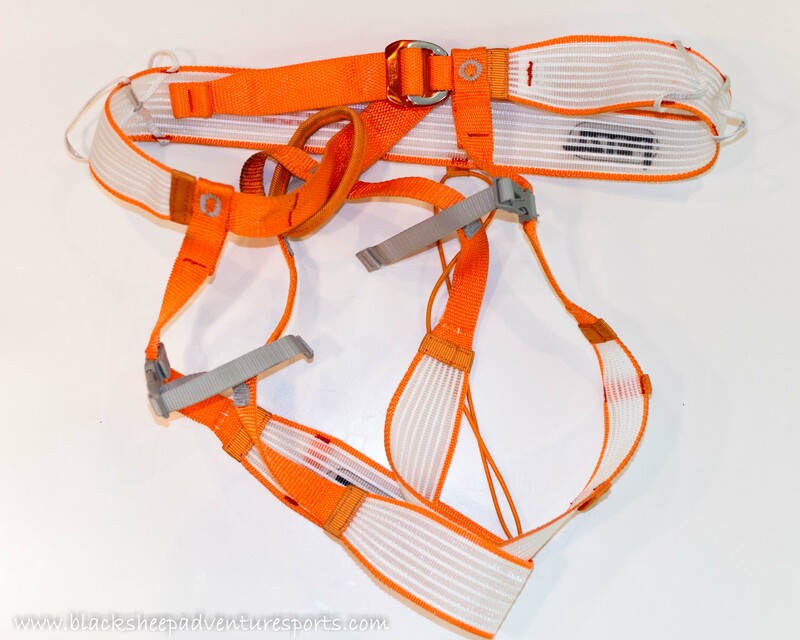 The gear loops on the Petzl Altitude harness are vertically mounted and made of spectra. Another unique feature on the Petzl Altitude are the ice screw keepers. 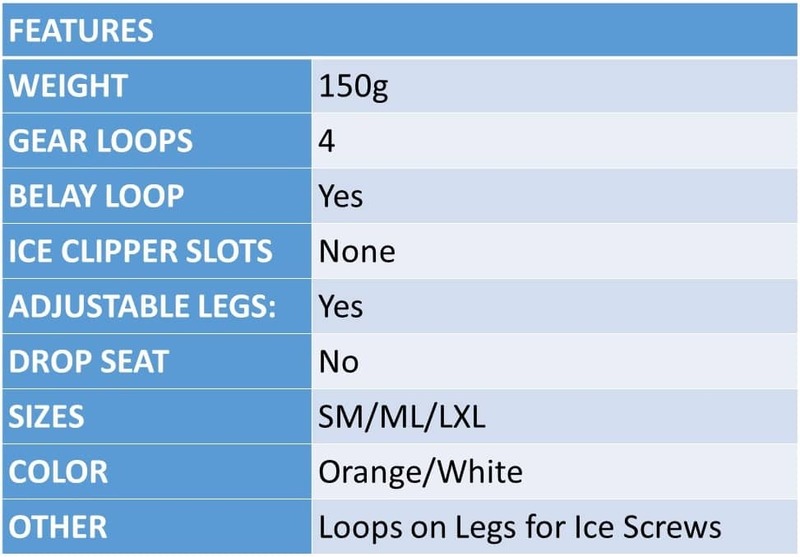 Basically a couple of elastic loops with a siliconized interior are located on each leg loop to hold an ice screw clipped into the gear loop in place. I’ve never had an issue with just hanging my ice screws, not to mention all my other crevasse rescue gear, from a gear loop on my harness or pack waist strap so I’m not sure what problem this design feature is trying to solve. Some people seem to like it though. The ice screw keepers on the leg loops of the Petzl Altitude harness. Both the waist belt and leg loops on the Altitude are constructed from the same material utilizing the Wireframe tech to create a stiff, load spreading, fabric. At 50mm wide the waist belt is on the narrow end of the spectrum and less comfortable to hang from than harnesses with wider belts though fine for short periods of time such as when rappelling. When walking or climbing the harness is virtually unnoticeable under a pack. And while the stiff material of the leg loops sometimes catches on each other when walking an adjustment of the legs loops quickly fixes the issue. 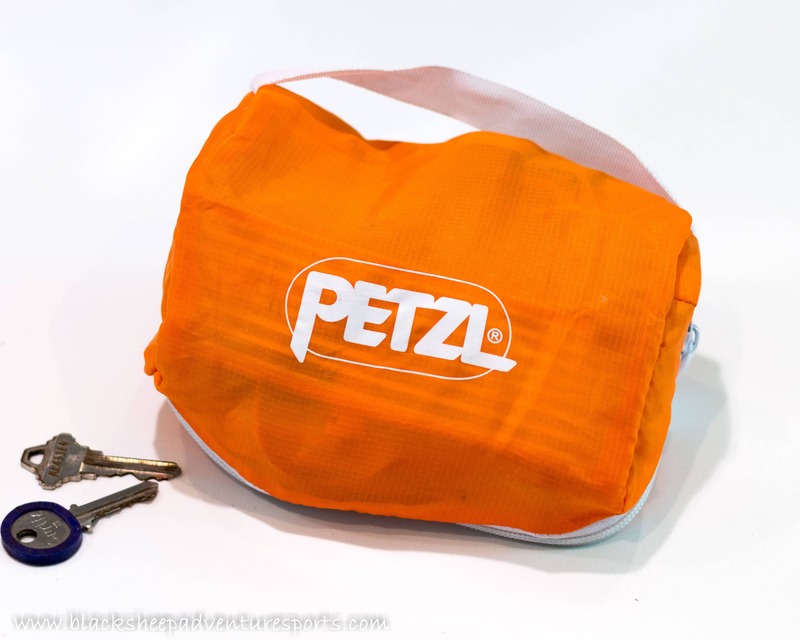 The bag for the Petzl Altitude harness is over-sized making it easy to stuff the harness in. Best Uses: Ski touring & ski mountaineering, summer mountaineering, just-in-case harness, long expeditions. Black Sheep Adventure Sports was provided with a test sample for review but this did not influence us in any way.